Prostate Cancer Antidotes / Newsletter Articles :: vHolistics :: Your Gateway to Health! There are several treatment options for prostate cancer widely available today. These include surgery, radiation therapy, and hormonal therapy. One surprising natural remedy is to take pomegranate juice. This fruit with antioxidant properties can inhibit cancer cell growth and retard prostate cancer progression. In 2010, prostate cancer is the second leading cause for cancer deaths in American men. About 1 in 6 men is diagnosed with prostate cancer during his lifetime. Prostate cancer is common in men above the age of 40. It is signified by a lump in the prostate created by an abnormal growth of cells. Prostate biopsy is done to detect the growth of cancerous cells in the prostate. People diagnosed with prostate cancer should be given treatment immediately, as delaying may cause the spread of cancer cells in other organs of the body. However, if prostate cancer is diagnosed early, chances of survival are very high. Treatment actually depends on certain factors such as age and how far the cancer cells have spread. There are four treatment options for prostate cancer widely available today. They are surgery, radiation therapy and hormonal therapy. In several men, an approach of withholding active treatment could be used. While treatment is withheld, the patient will be monitored closely for signs of change in their disease or develop new symptoms. If discovered at any time that the cancer is developing, active therapy may then be started. Alternatively, herbal supplements do help certain people. Ensure you read up about the product and the company selling. Go through the testimonials. Share your insights with your doctor, so he is kept in the loop of other supplementation you are consuming. One other natural remedy you might want to consider is pomegranate juice. Doctors often tell prostate cancer patients to drink pomegranate juice. Pomegranate is a fruit loaded with red seeds, and is extensively being used as medicine in many countries. This fruit with antioxidant properties can inhibit cancer cell growth and retard prostate cancer progression. When consumed, it releases chemicals that kill cancer cells. It also provides anti-carcinogenic activity that restricts cancer growth. According to Martins-Green, pomegranate juice compounds inhibit a protein in the bone marrow that causes prostate cancer, and likely other types of cancer cells, to spread to the bone. Consult your personal doctor for further advice. Keep a diary and take down the dates when you begin taking pomegranate juice and continue to watch your PSA levels. Start drinking pomegranate juice and drink your way to a healthy & cancer-free life! 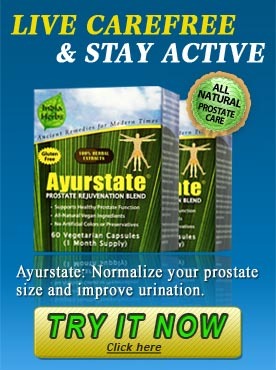 To learn more about natural means to help address prostate problems, please visit ayurstate.com.